Last weekend I braved the one way streets of Baltimore and attended the annual book festival along with two other book club friends. Dana was more than willing to drive which was fine with me as I have a severe case of “parallel parking phobia”, if there is such a thing. Fortunately we found a parking spot in an easy to navigate and very convenient parking lot. The weather was perfect and the crowds very manageable. 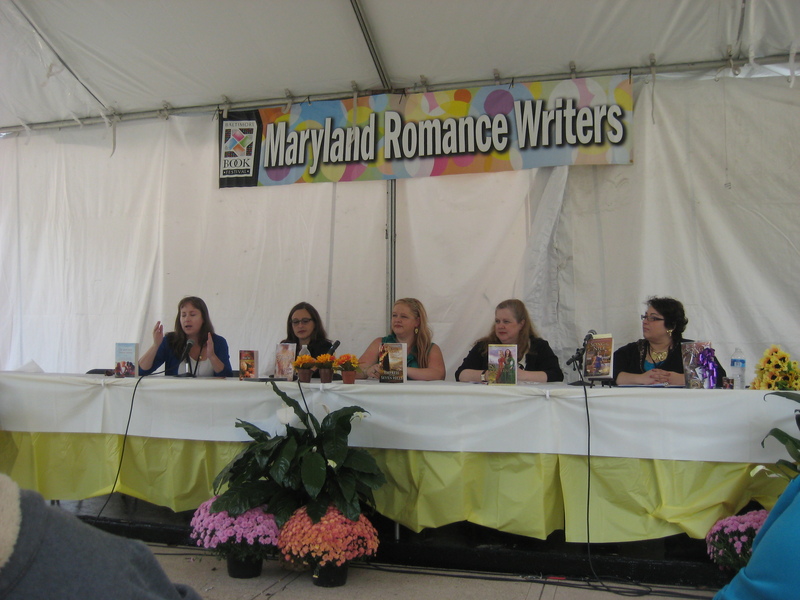 We easily spotted Ann, and although we didn’t make it in time to listen to Emily Griffin, the author of Where We Belong, we were just in time to grab a seat in the Maryland Romance Writers tent to listen to a talk on “What Is Women’s Fiction”. What could be better than that for the Friday Morning Bookclub? The panel of speakers included five accomplished female authors: Stephanie Dray, Lisa Verge Higgins, Sophie Perinot, Kate Quinn and Hope Tarr, each with their own definition of Female Fiction and how it differed from Romance Fiction. Here are some of the key points I picked up: The Goal of Women’s Fiction is to provide a catharsis of a woman’s journey. It is more about women being in love with one’s life as opposed to being in love with a man or another woman. These books are “female directed”. Their goal? To bring the lives of these women to life. Although the woman characters may have lived in a different time period they still dealt with the same problems as women today. Unlike romance novels, women’s fiction does not always have a happy ending. It is about their personal journey, their internal transition and learning how to love their own life. Each of these talented writers also entertained us with a reading from their book. I have to apologize for not giving credit to the individual women as to who said what. I just know that I would not get it correct. If only I knew short hand or had a tape recorder with me! 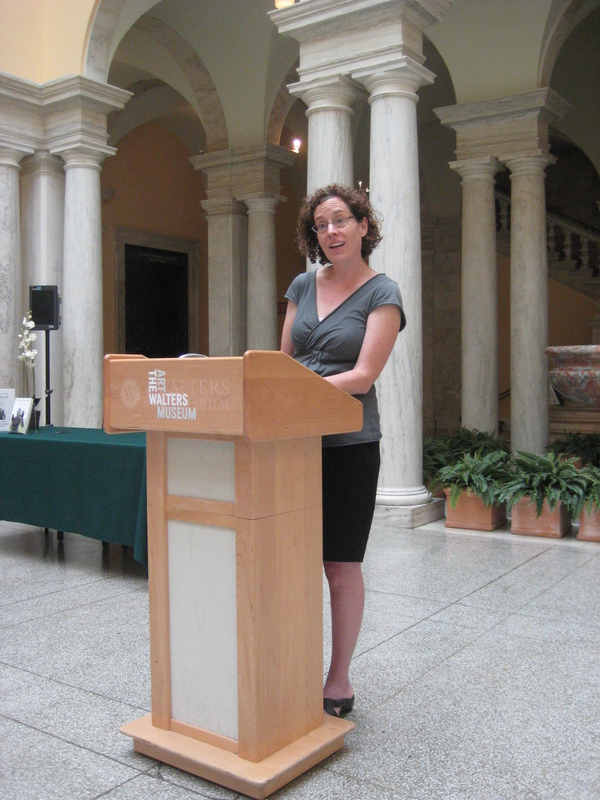 Next we hustled to the Sculpture Court in the Walters Art Museum to listen to Debra Spark talk about The Pretty Girl, her recently published book which includes 6 short stories and a novella. According to Wikipedia, my go to source, a novella is longer than a novelette and shorter than a novel. Debra read from several of her beautifully written and very entertaining stories, one of which was about a tiny, talking Rabbi in a chocolate egg and another about a schizophrenic. Although The Friday Morning Bookclub has yet to read a book of short stories, Spark’s readings certainly gave us something to think about. Why not read a book of short stories…..or perhaps poems! As we got on the elevator, the three of us were discussing the possibility of reading a book of short stories or perhaps poems, not paying any attention to who else was on the elevator with us. Of course we would have to find someone who knew something about poetry to come to our meeting. The next thing we knew, we heard the words “I’ll do it”. Yes, on the elevator was an English teacher from Garrison Forrest school. We have already been in contact! Next we rushed to Centerstage where we were ushered into a room where a rehearsal of the show Poe was in progress. It was fascinating watching the same scene being acted out over and over, each time slightly different due to suggestions from the director. The cast, director as well as all of the “stage hands” appeared to have a wonderful working relationship and looked to be truly enjoying what they were doing. Poe is about the final days of Edgar Allan Poe and is at Centerstage October 17-25. There was entertainment everywhere you turned. 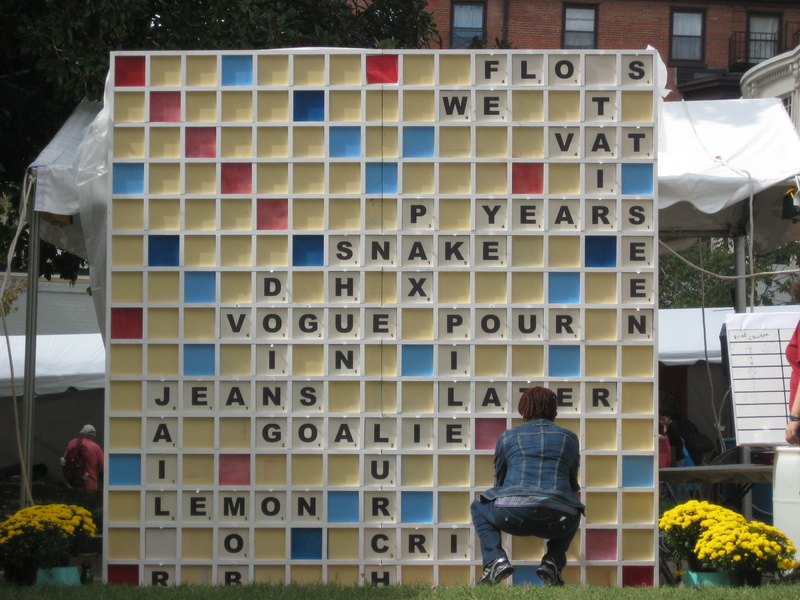 Music, dancing, booth after booth selling books and book related stuff, food and my favorite….A HUGE game of words with friends! Next year, I hope you will join me! I was there and thought the words with friends game was a hoot. 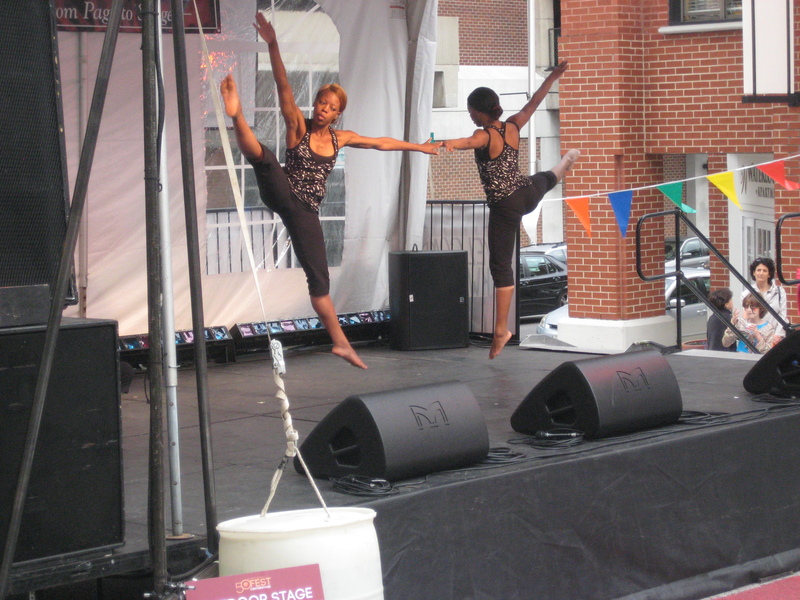 The dance performances were super.